Consider it the anti-app of Boston guides. If you're the kind of traveler who enjoys the heft and touch of a book over fussy capacitative tapping on Gorilla Glass, the brand-new Freedom Trail Pop Up Book of Boston just might be for you. It goes the printed guidebook one better by featuring fold-out spreads of the landmarks along the Freedom Trail that pop up like paper sculptures. Each double spread also has additional panels that pop up nearby landmarks or present more information. The opening spread, for example, highlights the State House, with a secondary panel of Park Street Church, information about the church's weathervane, and a bit of background about the Freedom Trail. Local author Denise Price was inspired to create the book when she first came to the Freedom Trail as a visitor in 2010 and was surprised she couldn't get a pop up book as a souvenir. Her quest to create one led her to learn the mechanics of such books and search the world for a company to print and assemble the book. With school vacation week coming up, the book just might be the engaging device to cajole kids into hiking the Freedom Trail. 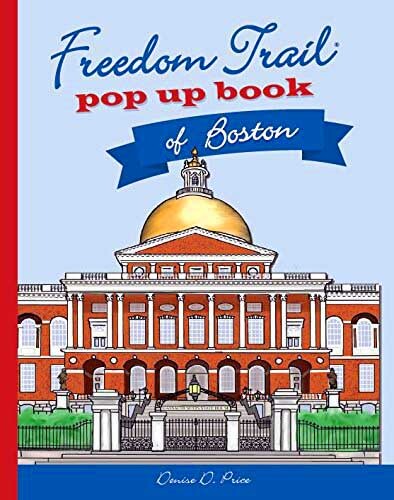 Published by Union Park Press, the Freedom Trail Pop Up Book of Boston debuts at the Old North Church on Thursday, April 16, at 5:30 p.m. A reception follows in the Old North Church gift shop. During school vacation week, the Freedom Trail Foundation will host a crafting and storytelling program in the Old North Church house on Wednesday, April 22, at 2 p.m. to introduce young history lovers to the art of pop up books. Look for the book in local bookstores.